Unlike other publications that are owned by billionaires, we are funded by our readers, average working folks, through small contributions. It allows doing reporting from the perspective of workers that you won’t find in other outlets. Now, with your help, we hope to do even more. Help Us Reach Our Summer Fundraising Goal of $10,000. So far, 182 people have donated $10,204. Join them. Danny Glover and Bernie Sanders seek France’s help after Nissan union vote. (August 12th in The Guardian). We want to keep covering this story, but need your help to do so. 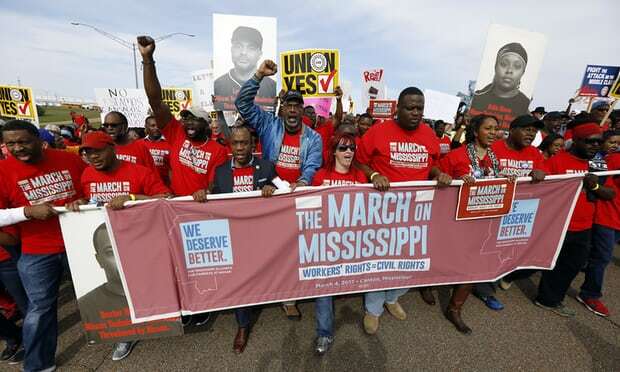 Workers hope that the NLRB will hold another election in six months. During that time, the union will have to prove the promises made by the company to stop the union drive were empty. It’s crucial that we continue to draw attention to this struggle, as workers on the shop floor continue their fight for a union. So help Payday stay and cover this vital story. Donate today! Help Us Reach Our Summer Fundraising Goal of $10,000. So far, 181 people have donated $10,204 Join them. Also, check out our recent video from our fundraiser at the People’s Summit featuring Randy “The Iron Stache” Bryce, Krystal Ball, John Nichols, and Nomiki Konst. Be sure also check out summer fundraising drive video where we outline all the work we did over the past year. Finally, check out our video from our shopping trip to Costco. Payday promises to spend all money raised in an ethical manner. Be the first to comment on "Donate: Help Payday Continue to Cover The Movement to #OrganizeTheSouth"